Our weekly club run starts at the Route One Café on the sea front by Deal Pier. 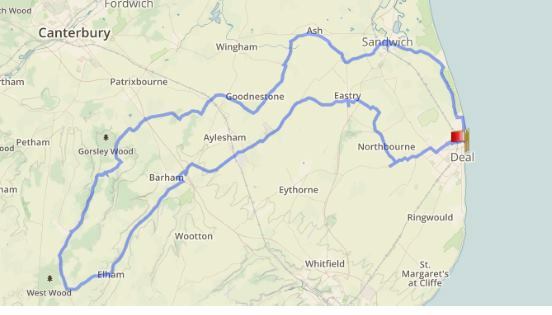 We head out along the ancient highway towards Sandwich then head inland through Ash, Goodnestone, Bridge over to Stelling Minni rather than hitting the hills straight away. Hopefully to give a better group ride with less splitting up and stop/starting on the climbs and gives everyone to catch up as well! We leave at around 9:00 but come for coffee at 8:30 if you fancy it. The ride is about 48 miles with a stop at the Lord Whisky Tea Rooms in Stelling Minnis for coffee and cake at about 11:00. We normally get back to Deal by 1:00 to 1:30 if you do the full ride. There are plenty of options of cutting it shorter if you need to. We have members that ride over to the meeting point from all around the area so if your not based in Deal just ask and chances are there’s someone who you can cycle over to the meeting point with if you wish.